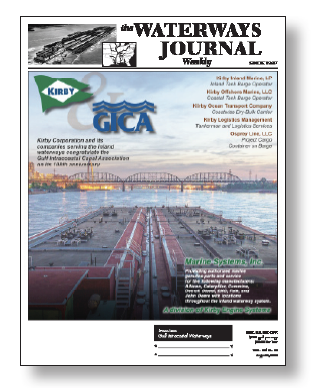 The Waterways Journal includes a wide range of news articles that provide a window into the people and technology behind a thriving major sector of industrial transport in the United States. Topics covered include inland shipyards, lock and dam construction, the Corps of Engineers, dredging news, inland ports and terminals, barge and towboat construction and launches, new technology relating to towboats, and regulations of the U.S. Coast Guard, Environmental Protection Agency, and other federal agencies that affect inland waterways commerce, as well as news about major commodities that travel the waterways, such as grain, coal, steel and fertilizer. The updated and expanded website includes virtually all of each week’s news and feature stories, including popular weekly articles like Washington Waves and the Old Boat column. The site features vastly improved search capabilities, allowing users to search archived stories by name, category or author. Initially, the new site includes all of the stories so far from 2018. Stories from previous years are being added to the site’s archives on a regular basis, with hopes of having years of stories uploaded soon. In addition, the Classified Advertising section has been completely reworked, so the ads will be much easier to find and to read. The site’s web store, where visitors can purchase books like the Inland River Guide and the Inland River Record as well as the WJ’s Stack Logo Poster and many other items, has been redesigned and improved. The site also includes access to the WJ Digital Edition, an electronic “page flip” version of the weekly magazine. Finally, unique multimedia features, including video, sponsored content, photo galleries and more are being added to the website. Those with a digital subscription can access all of this and more, plus receive the print version of the weekly magazine. Subscribe today via our online form or give us a call at: 314-241-7354. Please allow 2-4 weeks for the subscription order to begin.